Spring is in the air and Easter is almost here! If your lucky enough to have ham leftover from Easter this Asparagus and Ham Breakfast Casserole is the perfect to any day! You get the smokiness from the ham, freshness from the asparagus and a bit of sweetness from the sweet potatoes, plus it loaded with protein so you will stay full longer! To get things started spray a 9X13 casserole dish with non-stick cooking spray. Next wash and peel the sweet potatoes (if you aren’t a fan of sweet potatoes you can always use regular ones). If you have a food processor use the grater attachment and grate them or you can do the handy old school method like I did and use an actual grater (watch your fingers). Grate the sweet potatoes, so they are like hash-browns; place them in the casserole dish. Finley chop the onion and evenly distribute it over the potatoes; then add the salt and pepper. Evenly sprinkle the ham and asparagus over the breakfast casserole. Next add the egg whites (or Scrambled eggs) I used the egg whites just because I’m trying to be a bit healthier, but it is a holiday after all so go wild and use whole eggs! Bake in the oven for about 25-30 minuets or until the center is cooked through and not jiggly. If we are going to go wild you can also add a bit of swiss cheese about 5 mins before removing it from the oven to give it a bit of cheesy goodness and who doesn’t love that? 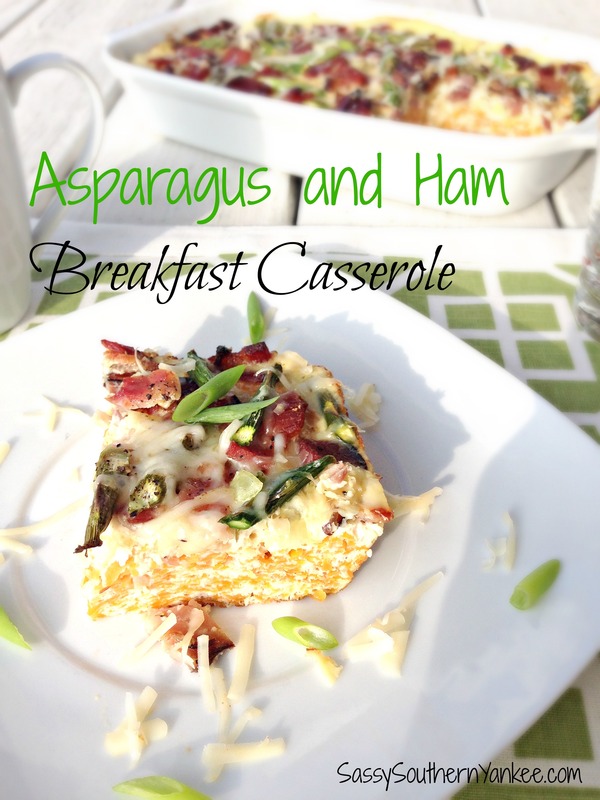 I hope you enjoy this easy Asparagus and Ham Breakfast Casserole! If your lucky enough to have ham leftover from Easter this Asparagus and Ham Breakfast Casserole is the perfect to any day! You get the smokiness from the ham, freshness from the asparagus and a bit of sweetness from the sweet potatoes, plus it loaded with protein so you will stay full longer! To get things started spray a 9X13 casserole dish with non-stick cooking spray. Next wash and peel the sweet potatoes (if you aren't a fan of sweet potatoes you can always use regular ones). If you have a food processor use the grater attachment and grate them or you can do the handy old school method like I did and use an actual grater (watch your fingers). Grate the sweet potatoes, so they are like hash-browns; place them in the casserole dish. Evenly sprinkle the ham and asparagus over the breakfast casserole. Next add the egg whites (or Scrambled eggs) I used the egg whites just because I'm trying to be a bit healthier, but it is a holiday after all so go wild and use whole eggs! Bake in the oven for about 25-30 minuets or until the center is cooked through and not jiggly. If we are going to go wild you can also add a bit of swiss cheese about 5 mins before removing it from the oven to give it a bit of cheesy goodness and who doesn't love that? I hope you enjoy this easy Asparagus and Ham Breakfast Casserole! This entry was posted in Breakfast and tagged Asparagus, Brunch, Clean Eating, Easter, Easter Brunch, Easter Bunny, Eggs, Gluten Free, Healthy Breakfasts, High Protein, Holiday Brunch, Paleo, Peter Cotton Tail, Sweet Potato.